So far we have seen that Charmed is a show that reveals in the juicy and surprising revelations. The Vera sisters always have a lot going on and bombshells are often dropped on the show. This episode was directed by another CW Gina Rodriguez and features someone I particularly love. This guest star brings the flair to any show he is on. 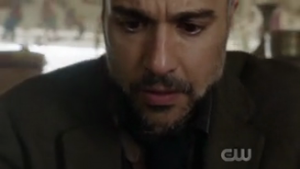 You might know him better are Rogelio De La Vega (Jamie Camil), from the CW hit show Jane the virgin. He is seen entering an antique store to buy a special pipe with which he releases a demon that possesses him. This episode is so already good throw in some a capella and it becomes gold. Cut to our favorite witches in Michigan, our baby witch, Maggie is auditioning for a spot on an a capella group with the song “walking on sunshine”. Harry is recovering from his Tartarus torture but he is looking for his son. Harry is not on board with the fact that Galvin knows their secrets. 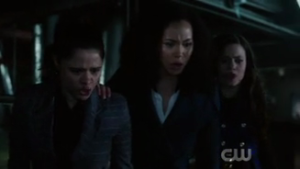 Macy breaks the news about her discovery in the last episode (she found out that she and Maggie is full sister while Mel is their half-sister) and they did not receive the news well. Maggie went for her audition but due to Macy’s unfortunate timing of the news she dropped, she bombed her audition and the director Mr. Miranda is none other than our demon possessed friend that is seen earlier. He picked her out of the other girls and she got a spot in the a capella group. Masy works a spell while with Gavin to show all the secrets that their mother has kept from them and she finds a box of correspondence between her parents. Pandora’s box anyone! After the auditions, Maggie is trying to compose a message to Ray when Lucy (kappa president that dated Parker) walks up to her. Maggie offers to leave the group but Lucy heard about the breakup with Parker and offers to cheer her up. Another Hilltones’ girl named Effie (pitch perfect’s Chrissie Fit) comes in and tells both of them that the solo belongs to her and no one else. Mr. Miranda gives them a potion to drink; he claims it is a drink to pre-game the voice. When Maggie gets home Macy is waiting for her with the news that their parents have been in touch and that they were in love the whole time. Maggie doesn’t take the news well and she storms off. Mel meets up with Jada and confesses to her that she was sent to infiltrate the Sarcana by the elders and she agreed because she and her sister thought the Sarcana killed their mother. Jada tells Mel that she knew all along as the Sarcana has an empath in their ranks. They shared a kiss which was captured by Niko on camera. Since they were in the spirit of sharing, Mel asks about what the sisterhood actually does and Jada invites her on a mission. At the a capella rehearsal, the group is performing a haunting arrangement of “Killing Me Softly.” Effie in true diva sense tries to breathe a little bit of life into her solo and Mr. Miranda criticizes her “Aguilera circa 2003” vocals and justifies his creepy arrangement. Effie protests and Mr. Miranda pulls her into a corner and traps her soul inside the cursed pitch-pipe that hangs around his neck. Macy with the help of Galvin learns that her dad knew about her mum’s powers. She reads a letter in which her dad recount her 10th birthday party to her mum and she wished that she could have had those experience with her sisters. During rehearsal break, Maggie opens up to Lucy about all that has been going on at home, Mags confesses that she wishes her life wasn’t so messy, Lucy tells Maggie that all families are messy in their own way. When Maggie notices Effie’s absence, Mr. Miranda explains that she has quit the group and Lucy immediately calls dibs on the solo. Mr. Miranda lets Lucy have the role and she launches herself at him for a hug but is told off by the music teacher. He shouts that she nearly crushed his antique pitch-pipe. The pipe caught Maggie’s eye and she touches it. She hears the sound of Effie screaming for help inside the pipe. She quickly alerts her sisters of the demonic pitch pipe she had touched. Jada and Mel are on their Sarcana mission at a bar when they spot a guy trying to roofie his date. While they are at the bar, Mel expressed her frustrations about not being invited to Maggie’s acapella performance. When Jada goes to the bathroom, Niko comes to Mel. Niko introduces herself to Mel and she reveals that she helps people. She told Mel that Jada has loved ones who are worried that she has run off to join a cult which is not very far from the truth. Niko warns Mel against letting Jada tempt her into joining the cult and gives Mel her number. Maggie calls Macy, Harry and Galvin (Harry is still not comfortable having Galvin in their ranks) and they are finding about what they can about the demonic pitch-pipe. According to the book of shadows, the pipe belonged to the siren of ancient Greece. Galvin grew up in New Orleans with a family of jazz musicians. 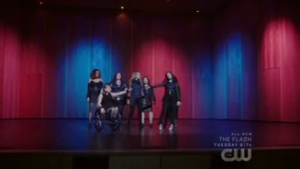 They discovered that Miranda plans to use the acapella group and their arrangement of “killing me softly to kill the audience. When harry tries to use his magic to transport them to the school his magic fails due to the torture he endured in Tartarus so Macy had to send the spell to her via text. As the Hill tones with the exceptions to Maggie take the stage, Maggie confronts Miranda and tries to perform the spell which fails. The demon in him reveals that he’s not a siren, but that he is the maestro behind the sirens. 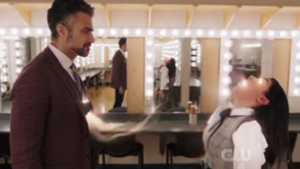 Since the group was already performing the death song, Macy uses magic to restrain Miranda. Since Galvin is a human, he begins to go down due to the songs. Maggie realizes that the special tea Mr. Miranda has given them made them immune to the song so she gives him some of it while Miranda escapes his restraints. Macy suddenly realized that it’s not the song but the arrangement of the song that is killing the people and she suggests that they rearrange the song and it worked. Maggie busted on stage and sang in a peasant octave. The rest of the group joined her and they saved bother the performance and the audience. Meanwhile Harry is at home researching the pipe and then calls Mel to tell her how to take down Mr. Miranda. He informs her that the pipe just has magic to trap the souls which means Mr. Miranda and Effie are still alive. The sisters have to use the power of three to defeat the demon which they couldn’t do since they were in a fight among each other. They made up and talked about their differences so they could use sister power on the demon. In order to the pitch pipe and trap the demon, they need to play the Devil’s Tritone. The sisters had to kiss and make up literally by apologizing to each other. They succeed in using their powers on the demon then throw the pipe down to Galvin who plays it hence realizing the spirits trapped in it. Galvin officially took down his first demon which makes him officially a member of the team. 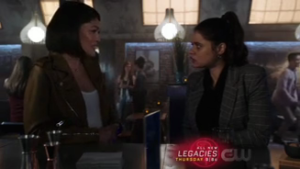 Since the sisters are back on speaking terms Mel tells her sisters about Niko. Despite wanting nothing with the letters Maggie and Macy go off to read and bond over the letters. Mel goes to see Jada and tells her about her history with Niko. In the attic, Charity comes at Harry’s request. She was worried he regrets finding out the truth about his son, he says that he is trying his best to find out what really happened. 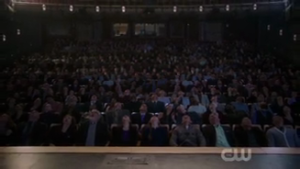 However, he didn’t ask her to come because of his son he came because he wants to leave the charmed ones. He informs her that he feels distracted and changed after his time in Tartarus and wasn’t sure he had what it takes to do the job. She tells him he has to tell them himself. 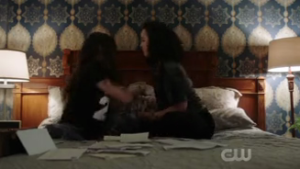 In Macy’s room, Maggie and Macy find a letter that states that Dexter Vaughn (her father) and Marisol Vera (her mother) brought her back from the dead.